Tarrant County typically implements a No Refusal period during major holidays. Being in the Christmas spirit, we thought that our No Refusal warning would be better if it rhymed. Enjoy our Christmas No Refusal poem. Searching for drunk drivers that might be about. They’ll be near the parties at restaurants and taverns. They’ll pull your car over for bizarre driving patterns. And if you misstep, to the pokey you’ll go. To see how much eggnog you’ve had on this night. To get a search warrant as quick as a flash. So take an Uber this Christmas, a lesser price you’ll pay. 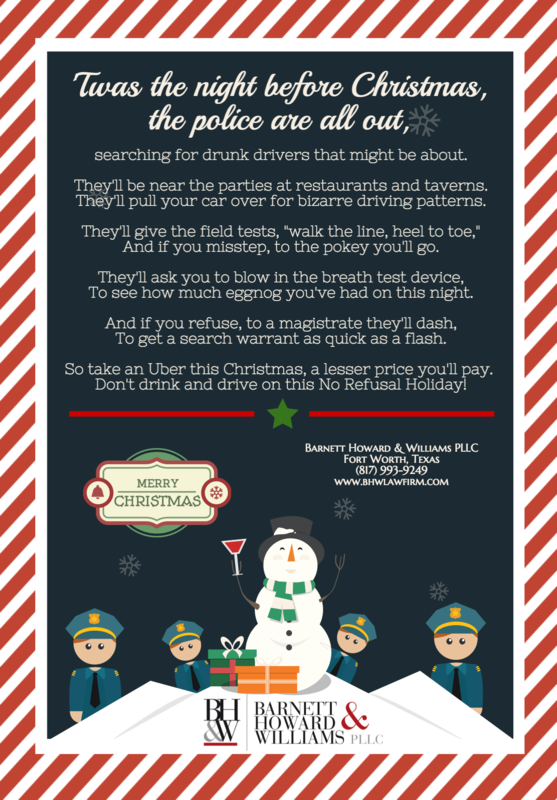 Don’t drink and drive on this No Refusal Holiday. Throughout the year, as various holidays approach (Christmas, New Year’s, Super Bowl weekend, 4th of July, etc. ), we receive questions about “No Refusal Weekends,” in which police agencies crack down on driving while intoxicated or DWI. It is important that Texas motorists understand the rules of the road, so that every holiday season remains merry and bright. Many have seen the “No Refusal” notices on electronic road signs, heard the “No Refusal” advertisements on the radio, or watched stories on the news related to “No Refusal” for suspected drunk driving. What is “No Refusal” and how does the law impact your holiday travel? Understanding a few basic things about the law could help you in the event of a traffic stop or a detention by a law enforcement officer. 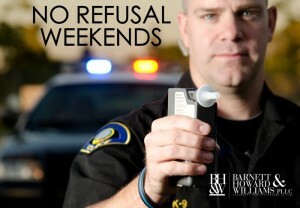 What is No Refusal Weekend? No Refusal Weekend refers to a short period of time, typically a holiday weekend or the weekend of a special event, such as the Super Bowl, where law enforcement advertises the ability to conduct routine traffic stops, detaining motorists for suspected DWI. During the stop, law enforcement requests a blood or breath sample, and, if the motorist refuses to comply, law enforcement immediately contacts a judge or magistrate who is designated “on call” during the No Refusal time frame. If the law enforcement officer conveys to the judge that (1) there was reasonable suspicion to detain the motorist for a traffic or criminal offense, and, (2) there is probable cause to believe the motorist is driving under the influence of drugs or alcohol, then the judge quickly issues a search warrant for the sample. Tex. Transp. Code §§ 724.011(a), 724.012(b), 724. 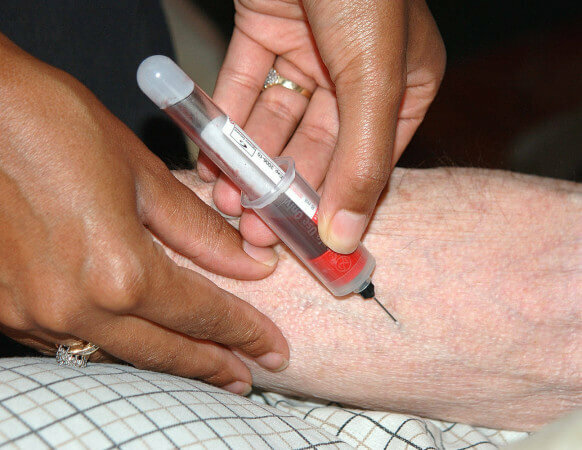 At that point, law enforcement may call for a phlebotomist to take the sample on site, or may transport a motorist to a facility to obtain the sample. If all goes according to plan, “no refusal” speeds up the process by which law enforcement obtain samples used for DWI/DUI arrests. Further, the sample becomes evidence for trial. 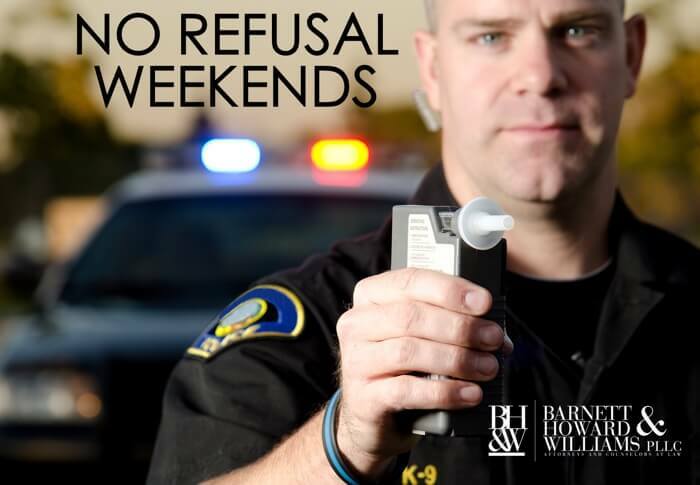 What is the purpose of No Refusal Weekend? The entire No Refusal process from detention to arrest is faster in theory, the goal being to catch motorists who are driving under the influence quickly, and to capture the highest blood alcohol content (“BAC”) possible. In Texas, a BAC level of .08 is considered legally intoxicated. No Refusal Weekend differs from a DWI stop on regular days by it’s speed — the quick phone call to an “on call” judge who is waiting by the phone to issue warrants — and it’s deference to law enforcement in the moment. So what does this mean for you, the Texas motorist? You have the right to refuse blood and breath tests initially. The term No Refusal sometimes confuses motorists. Many believe they cannot refuse a law enforcement officer’s request for a sample during a No Refusal period. Not true. On No Refusal Weekend motorists still have the right to refuse to provide blood and breath during a traffic stop. However, if law enforcement obtains a search warrant for blood, the motorist must comply; failure to comply may result in additional charges. Once the officer has a warrant in hand, the rules change. 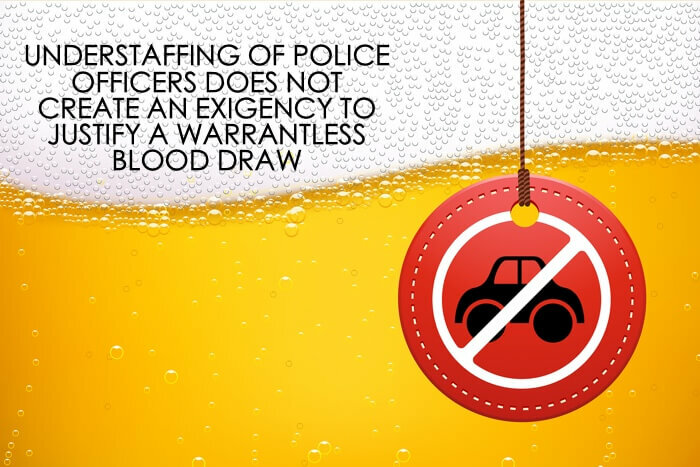 But before the officer obtains a warrant, you can refuse to provide breath or blood and you may refuse to submit to field sobriety tests. For notifications about when No Refusal Weekends begin in the Dallas Fort Worth area, and to know your rights if you are stopped by an officer, download our free App from the App Store or Google Play — know your rights before you go out! *Note: Refusal of a breath or blood test may result in temporary loss of driving privileges, even if the officer later obtains a warrant to conduct the search. The courts will typically grant an occupational driver’s license to work and household tasks. Warrantless searches for blood alcohol content in DWI cases violate the Fourth Amendment. The No Refusal law comes from an “implied consent” provision in the Texas Transportation Code. The 2007 law states, “if a person is arrested for…operating a motor vehicle in a public place…while intoxicated…the person is deemed to have consented…to submit to the taking of one or more specimens of the person’s breath or blood for analysis to determine the alcohol concentration or the presence in the person’s body of a controlled substance, drug, dangerous drug, or other substance.” Tex. Transp. Code §§ 724.011(a), 724.012(b), 724. 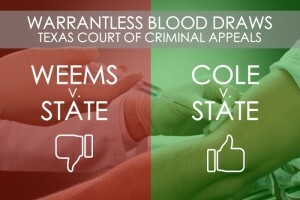 However, in 2014, the Texas Court of Criminal Appeals held that “warrantless, nonconsensual testing of a DWI suspect’s blood does not…fall within any recognized exception to the Fourth Amendment’s warrant requirement, nor can it be justified under a…Fourth Amendment balancing test.” State v. Villareal, PD-0306-14 (Tex. Crim. App. 2014). See also, the US Supreme Court’s opinion in Missouri v. McNeely. In summary, a motorist may refuse a blood or breath test upon an initial request by law enforcement, but after a warrant is obtained from a judge, a motorist may not refuse at that point because it is mandatory—hence the name No Refusal. Please take the time to know your responsibilities and rights before heading out on No Refusal Weekends in Texas. Download our App on the App Store or on Google Play for the latest information on No Refusal Weekends. Have a safe and happy holiday season! This article is for educational purposes only and does not take the place of legal advice. If you are in need of a DWI attorney, please contact our office for a free consultation at (817) 993-9249. Words like honesty, trustworthy, compassionate, sincere and caring only begin to describe this firm. Sutherland v. State (2014)- On the night of February 2, 2011, Austin PD Officer Housmans initiated a traffic stop after a vehicle changed lanes without using a turn signal. Once the vehicle had pulled over, Housmans approached the driver, appellant Sutherland, and, after speaking with him for “a bit,” asked the appellant to step out of the vehicle. Housmans administered field sobriety tests on appellant, and arrested appellant based on his performance on the tests and on his suspicion that the appellant was driving while intoxicated. Appellant refused to provide a breath specimen. Dispatch provided Housmans with Texas DPS records showing that appellant had two or more previous convictions for DWI. 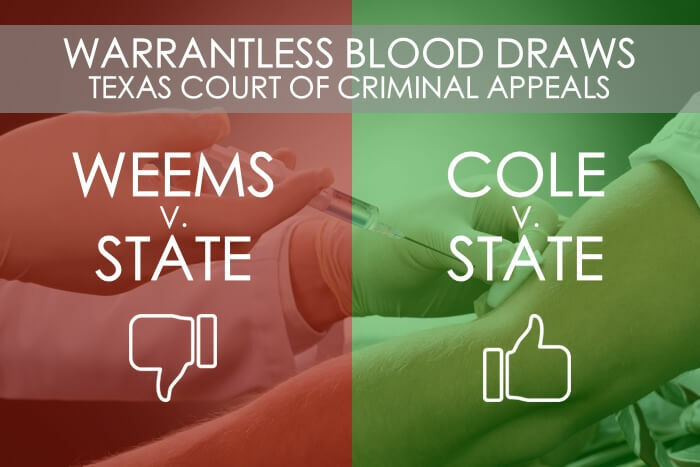 The appellant was then transported to the Travis County jail where, ultimately, a blood sample was drawn without appellant’s consent and without a warrant. 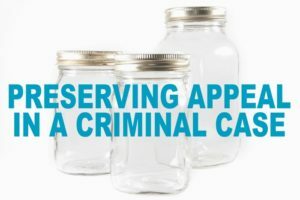 Following the trial court’s denial of a motion to suppress evidence of his intoxication, appellant pleaded guilty to the charges but reserved his right to appeal the trial court’s ruling. The appellant appealed his conviction for felony DWI. The appellant challenged the constitutionality of the procedure and authority under which a sample of his blood was taken without his consent. 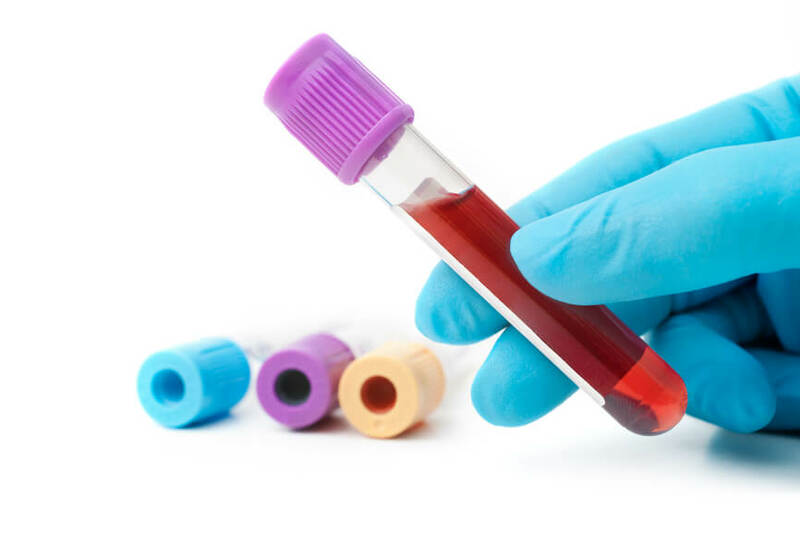 Appellant contends that the trial court erred by denying his motion to suppress the results of the testing done on the sample of his blood taken in such a manner. Housmans claimed that he relied on the provision of the Texas Transportation Code that required him to obtain a sample of a suspect’s blood whenever he learns that the individual has been convicted two or more times of DWI. Appellant maintained that, regardless of the mandatory language of the Transportation Code, constitutional protections against unreasonable searches and seizures require that a warrantless search be supported by an established exception to the Fourth Amendment’s warrant requirement, in this case, the exigent circumstances exception. Appellant further contended that no established exception-exigent circumstances or otherwise – applied here. 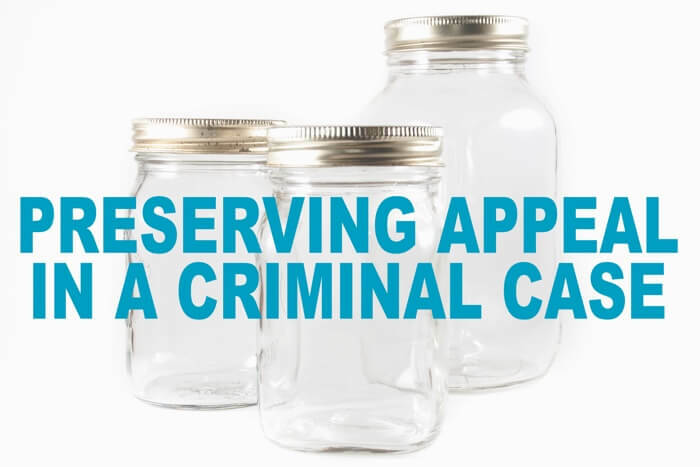 According to the Seventh Court of Appeals- Amarillo, the arresting officer was not faced with exigent circumstances such that the natural dissipation of alcohol from appellant’s bloodstream would support a warrantless seizure of a specimen of appellant’s blood. The arresting officer did not describe any factors that would suggest he was confronted with an emergency or any unusual delay in securing a warrant. He testified that he made no effort to obtain a warrant because he believed that the law required that he obtain a blood sample under the circumstances presented to him. The appellant was not transported to the hospital for medical care, the scene of the traffic stop was not very far from the booking facility, and transportation time was not a factor that could be said to lend to the exigency of the circumstances. Furthermore, while the unavailability of a magistrate may affect whether an exigency exists to justify a warrantless blood draw, a magistrate is available twenty-four hours a day, every day at the Travis County central booking facility. Therefore, based on these facts, the trial court erred by denying the defendant’s motion to suppress. Reversed and remanded. Missouri v. McNeely, No. 11-1425 (U.S. Apr 17, 2013). The Defendant was charged with DWI. He filed a motion to suppress the results of a warrantless blood draw that was taken without a valid search warrant. The trial court granted the motion to suppress. The Missouri Supreme Court affirmed the grant of the motion. The U.S. Supreme Court granted certiorari to resolve a split of authority. The U.S. Supreme Court affirmed the Missouri Supreme Court. Kennedy concurred. Roberts concurred in part and dissented in part. Thomas dissented. The question was whether the natural metabolization of alcohol in the bloodstream presented a per se exigency that justified an exception to the Fourth Amendment’s warrant requirement for nonconsensual blood testing in all drunk-driving cases. The Court held that it did not. While the natural dissipation of alcohol in the blood may support a finding of exigency in a specific case, it does not do so categorically. 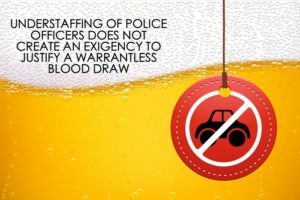 Whether a warrantless blood test of a drunk-driving suspect is reasonable has to be determined on the totality of the circumstances. Any compelled intrusion into the human body implicates significant, constitutionally protected privacy interests. 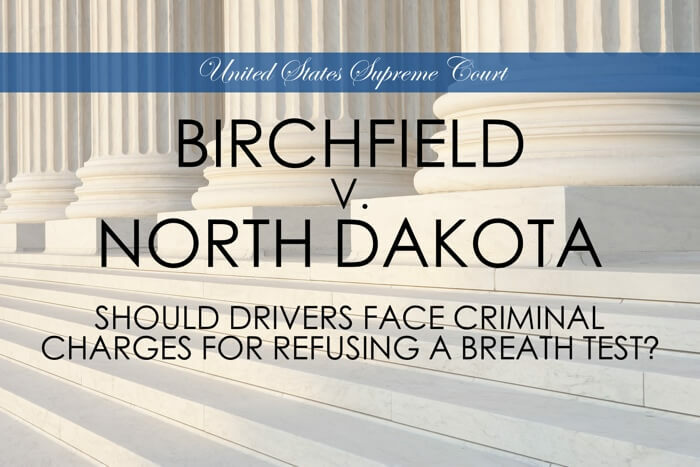 The general importance of the interest in combating drunk driving does not justify departing from the warrant requirement without showing exigent circumstances that make securing a warrant impractical in a particular case. Because the case was argued on the broad proposition that drunk-driving cases present a per se exigency, the Court was not provided with an adequate analytic framework for a detailed discussion of all the relevant factors to determine the reasonableness of acting without a warrant. 2) Whether the means and procedures employed in taking [the suspect’s] blood respected relevant Fourth Amendment standards of reasonableness. We are this not presented with the serious questions which would arise if a search involving use of a medical technique, even the most rudimentary sort, were made by other than medical personnel or in other than a medical environment – for example, if it were administered by police in the privacy of the stationhouse. To tolerate searches under these conditions might be to invite an unjustified element of personal risk of infection or pain. Id. at 771-772 [emphasis added]. Well…what if a police officer draws the blood? At the stationhouse? This happened in State v. Johnston. 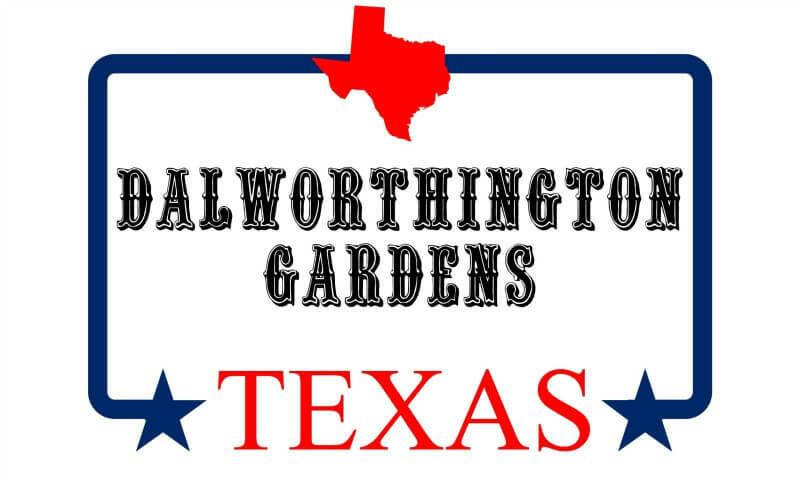 A woman was arrested for suspicion of DWI and two Dalworthington Gardens officers drew her blood at the Dalworthington Gardens stationhouse. That the officers had a warrant did not convince the suspect to comply with the request to draw her blood. Ultimately, the officers had to strap her to a table using gauze to keep her still enough to draw her blood. Although the officer that drew the blood was a prior EMT and had been certified by a local physician to draw blood, the trial court suppressed the blood evidence, finding that the search was unreasonable under Schmerber. Troubled by the fact that the officers did not ask the suspect for a general medical history before conducting the blood draw, the fact that the blood draw was not recorded, the fact that the suspect was restrained, and the fact that the department did not have any clear guidelines for using force during DWI blood draws, the 2nd District Court of Appeals (Fort Worth) agreed that the trial court appropriately suppressed the evidence. The State appealed, arguing that the Court of Appeals’ interpretation was too narrow. The defendant also appealed, arguing that the Supreme Court intended a per se ban on police officers drawing blood from DWI suspects. The Texas Court of Criminal Appeals began its analysis by recognizing that the “for the general population, the Supreme Court has determined that a blood test is a reasonable means in which to analyze an individual’s blood alcohol content.” And in this case, because there was no evidence that the suspect suffered from a medical condition that would have made another means of testing preferable, it was not unreasonable (under Schmerber) to draw the suspect’s blood. The CCA also held that Chapter 724 of the Texas Transportation Code – the chapter that deals with the implied consent law and details who may draw a person’s blood – is inapplicable to a reasonableness determination in this case, because the officers had a warrant. The defendant argued that because a police officer is not listed as a person authorized to draw blood under Chapter 724, the blood draw was unreasonable. Chapter 724, the CCA concluded, applies only in cases where there is no warrant. Regarding the test for reasonableness, the CCA concluded that “the reasonableness of the manner in which a DWI suspect’s blood is drawn should be assayed on an objective, case-by-case basis in light of the totality of the circumstances. In this case, the totality of the circumstances indicate that the search was reasonable. The officer that drew the blood was a licensed EMT. (He had also been certified by a local physician, but the CCA didn’t care about that). The Supreme Court (Schmerber) does not require that the draw be done in a hospital or clinic and several other jurisdictions agree. The trial court concluded that the officers followed medically accepted procedures for drawing the blood. The use of reasonable physical force to obtain a blood sample is permissible. The CCA held that the blood draw performed at the stationhouse by the police officers was reasonable under the Fourth Amendment and Schmerber. I would agree (in this case). I wonder how many police officers (especially ones that deal regularly with DWI) are getting in line to get EMT certified now.